Team Stryker is back! I’m deeply sorry for the long period of silence on the website between issues 9 and 10. I managed to finish Mission 009 just in time to have it debut at the Edmonton Comic Expo in September and have been hard at work on Mission 010 ever since. Mission 010 is going to be my biggest issue to date at a whopping 36 pages! I wanted to do something really special for my tenth(!) issue so I’m pulling out all the stops. I will apologize in advance if I have a hard time keeping my posts weekly, but I’ll do my best. I’m not cutting any corners on this issue so each page may take me a little longer to complete. Team Stryker is still proudly a one man operation so the time it takes for me to draw, ink and color each page adds up quickly. As always I’ll be posting updates and sneak previews on Facebook, Twitter and Instagram at TSComic so be sure to follow along. Team Stryker will update on the website every Monday so keep checking back here for the final pages. 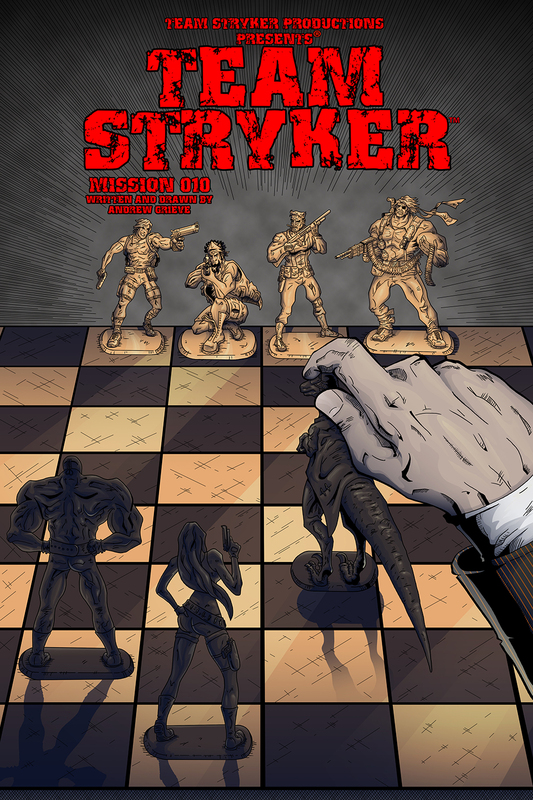 Thank you all for your support as we start the tenth issue of Team Stryker!